This web project is conceived as an educational tool that will allow students of the Spanish epic to understand and appreciate the oral essence of the genre and to recognize the enormous conceptual distance between an oral narrative poem and the modern textual editions used in the classroom. This oral epic narrative was recorded on parchment in 1207, eventually leading to its treatment as written text and to the occlusion of its oral essence. 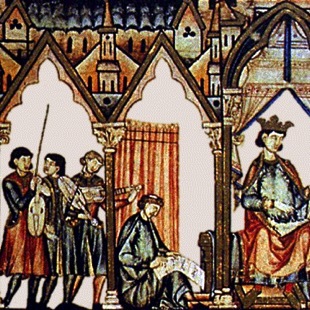 The original manuscript was copied at least once, in the unique fourteenth-century copy that resides in the Biblioteca Nacional in Madrid. The oral narrative poem represented in this unique manuscript may have evolved over a period of one hundred years. The classroom setting and its inherent time limitations are obstacles to the recreation of the oral essence of epic narrative. Printed editions of the poem are portable and therefore convenient, but modern editions treat the poem as another literary text, conceived in writing for readers. This conception leads editors to reconstruct the poem as text, to number the verses, to split them into two hemistichs, and on occasion to modify them in order to achieve a more correct reading or consistent assonance. The verses are grouped according to assonance, and these groupings are then numbered and sometimes given headings. Such modern editions and the reading aids they include create a nearly insurmountable obstacle to the appreciation of the poem as oral narrative. This web site, with its recorded oral rendition of the poem, allows for the savoring of the epic in its oral form without the time limitations of three weekly class meetings. Students can listen to the 5 hours, 9 minutes and 28 seconds [05:09:28.10] of epic narrative without ever seeing a written word, if they like, as many times as they please. Students and others who experience the poem in this way can begin to truly appreciate, understand, and assimilate the noble expression of this epic narrative. As the first literary text of Old Spanish, the poem and its oral rendition also encourage the study and contemplation of the unique pronunciation of the precursor to modern Castilian.